Find solid hardwood dining tables of all kinds. From extending to glass styles, they'll hold up to whatever family dinner throws at them. We know there's a lot more to your average dining table than meets the eye. It's more than just a place to grab a bite at the end of a long day, it wears as many hats as you do! Whether that's the centre of family meals, the makeshift home office, or the launchpad for your new business, a dining table is a real focal point in your home. Which is exactly why we go the extra mile with our above-average selection of tables, made only from 100% solid hardwood. Since real life doesn't always come with a set of matching placemats and coasters - though they do help - our dining tables are made to stand up to life's everyday knocks, with protective wax finishes, and the top quality timbers that will keep turning heads hear after year. Discover looks that will fit every home from the modern traditional to the stylish studio. We have a large selection of 100% solid hardwood dining tables, all made to our exacting standards. We're picky about what comes into our homes! Find smaller sizes - like 3ft and 4ft tables for compact dining rooms, all the way through to larger sizes - like 5ft and 6ft dining tables, seating from 4 to 12 people. And if you're looking for flexible dining solutions, our extendable tables will tick all the right boxes. Enjoy the clean lines and ageless looks of natural solid oak dining tables, or explore our other style offerings, made with the same attention to detail and quality construction our furniture is known for. Explore the unique finish of hardwood mango, or add some colour to your space with our gorgeous painted hardwood tables. With more than twenty ranges to explore, we know you'll find a look you'll love. 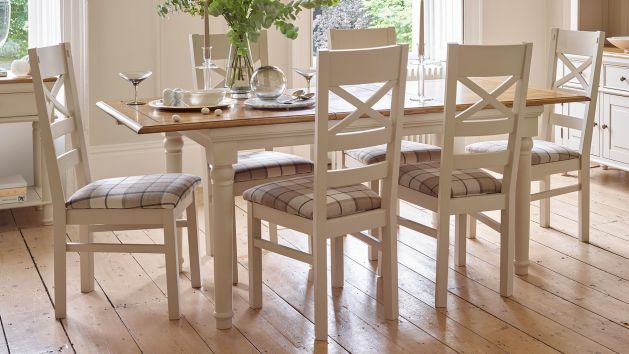 If you're looking for something to blend in with our favourite pieces, or are looking to start fresh, an Oak Furniture Land dining table is the perfect focal point. It's as good on the inside as it looks on the outside. Browse our full range of 100% solid hardwood dining tables today and find the perfect solution for your family. And don't forget about our free delivery options to your dining room.